One of the world’s most eminent sporting contests, the British Open, will return to Northern Island’s Royal Portrush Golf Club this year for the first time since 1951. It will also mark only the second time in The Open’s rich 150-year history that it will be hosted outside of Scotland and England. Joe Carr, Carr Golf’s late founder and one of Ireland’s greatest golf heroes, won one of his three British Amateur Championship’s at Royal Portrush in 1960. In addition to teeing it up on “bucket list” Portrush as our patriarch did, here are more Emerald Isle “must plays” we here at Carr Golf highly recommend. A reminder, availability is becoming scarce so contact our sales team straight away to guarantee your tee times. A 30-minute drive from Royal County Down is Ardglass Golf Club. As natural of a course as you’ll find, the rousing 18 hugs the coastline, with eight holes hard against the mesmerizing vistas of the Irish Sea. The 1st tee backs up against the imposing castle clubhouse, which dates to 1405 and is the oldest in the world. The opening drive at Ardglass portends the fun ahead with over 40 feet of imposing black cliff to be cleared and the unforgiving sea gobbling up anything hit too far left. Ardglass is simply one of those courses that true aficionados of world golf travel must have on their resumes. Two hours southeast from Portrush is Royal County Down Golf Club, ranked the No. 1 course in the world by Golf Digest. 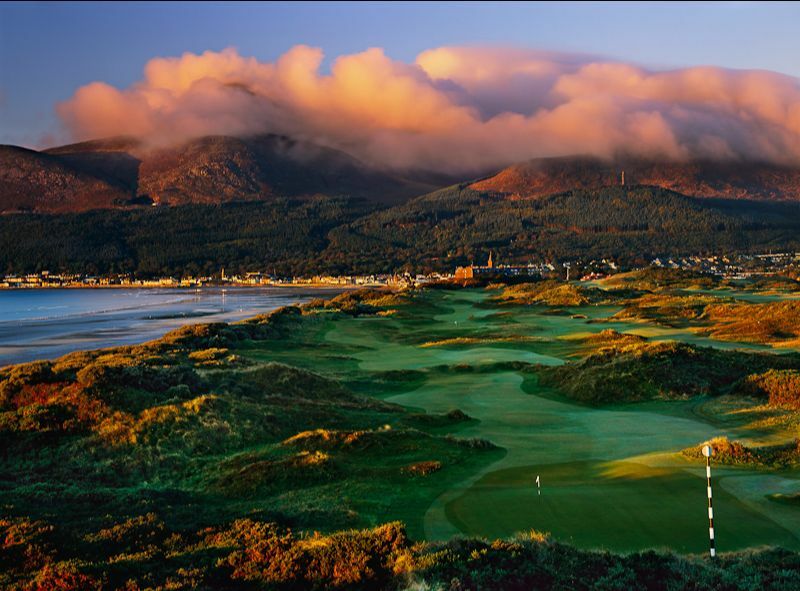 Set against the backdrop of the dramatic skyward thrust of Slieve Donard, the highest mountain in Northern Ireland, the Old Tom Morris-designed classic layout stretches along the rollicking linksland hugging the shores of Dundrum Bay. Each hole is in a world of its own with the ribbons of fairways, domed greens and famous “bearded” bunkers framed throughout by the vibrant yellow gorse and muted purple heather. The ninth hole is one of the most photographed in the game. Playing directly toward Slieve Donard, the 486-yard par 4, starts from a huge mound for the tee shot down to a fairway 60 feet below. The difficult approach is from the bottom of the slope with two ball-grabbing bunkers protecting the front of the green. It’s one of the great holes in the world and worth a trip to the Emerald Isle all by itself. Also not to be missed when in Ireland with golf clubs in tow is playing the beyond dramatic Old Head Golf Links. Co-designed by JB Carr, building commenced in 1993 and the course was later opened for business in 1997. It must be seen to be believed. On the rugged southern shore of the Emerald Isle, jaw-dropping Old Head is built on 220 acres of diamond-shaped land jutting out boldly for over two miles into the Atlantic Ocean. It’s Pebble Beach on steroids. 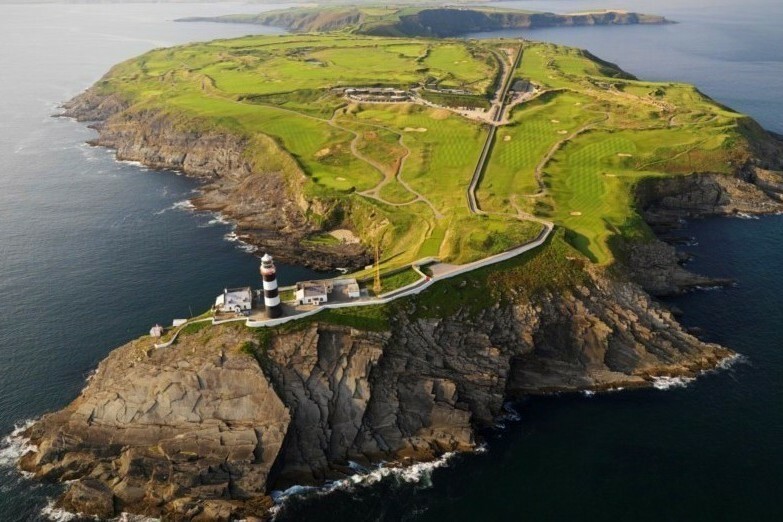 Nine holes at Old Head play along the dramatic cliff tops with all 18 holes showcasing some of the most stunning ocean panoramas on Earth. With the ever-changing sea breezes blowing every which way, the course supplies a stern test of the ancient game for players of all abilities. We recommend you tie your golf shoes up tight, hold on to your golf hat and savor one of the greatest rounds of golf you’ll ever have. Old Head is the epitome of a true “bucket list” course.